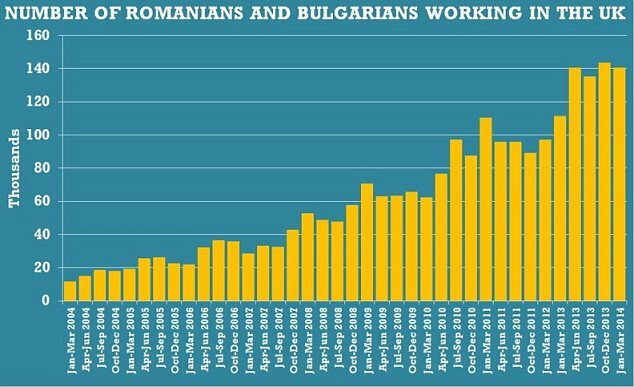 The number of Romanians and Bulgarians working in Britain fell after employment curbs were lifted in January, new figures showed today. Ministers boasted that the predicted ‘influx’ had not happened, in part as a result of new rules limiting access to benefits for new arrivals. In the first three months of 2014 there were 140,000 people born in the two countries working in the UK, down from 144,000 in the last quarter of 2013, but up from 112,000 at the start of last year. Britain was required to lift temporary restrictions on the free movement of people from Romania and Bulgaria at the start of 2014. Several Tory MPs had called for the work restrictions to be extended to limit the impact on the British jobs market.